Southeast corner of Spring and Mulberry Streets, Manhattan, in 1976. One of my continuing themes in this series is how little New York changes from decade to decade despite the stereotype that it is constantly changing. 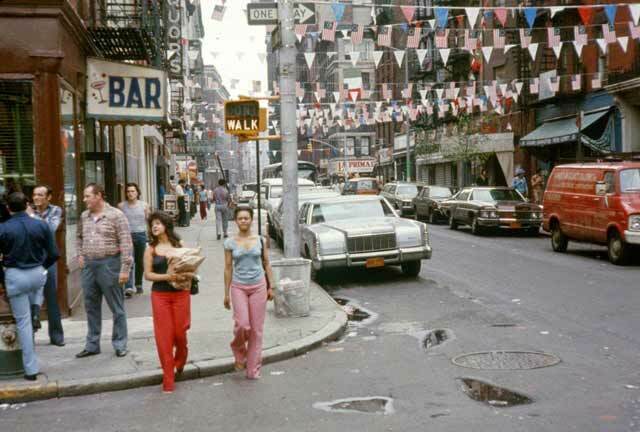 I found the above picture of Mulberry and Springs streets in Manhattan from 1976 and grew curious how it looked now. So, I did a comparison of the corner of Spring and Mulberry Streets from 1976 to the 2010s. As the below photo from Google Street View shows, the corner actually hasn't changed that much. The building on the southeast (left) corner hasn't changed, and you can verify that it is indeed the same building by noting the fire escape in both pictures (modern buildings don't have external fire escapes). The stanchion bearing the new (in 1976) "Walk" sign appears to be the same stanchion in the recent photo - they probably never have to replace those unless they're hit by a truck or something. The buildings across the street appear to be the same, too, though they are obscured in the 1976 photo by the flags for whatever celebration they were having. In 1976, they had the first "Tall Ships" celebration, so maybe it was for that. What interests more than the things that haven't changed, however, are the subtle differences between the two photographs. The business on the corner at 51 Spring Street used to be a working man's bar - a classic "pub," as they would call it in England. Behind it was a liquor store. Now, the address has a typical little restaurant and pizzeria. New York City used to be a hard-drinking city, with working-men bars all over. There are still bars, of course, but nowhere near to the same extent as in the 1970s. By and large, they tend to be "classy" joints now, not your old-style shuffle in, sit on the stool nearest the bartender, and order a double bourbon. Another ubiquitous little sight in 1976 - not in this photo - was the little green sign for OTB Parlors. Off-track betting was legalized in 1970 and OTB sites began springing up in 1971. There were 100 such parlors throughout New York City at one point. However, betting on the horses became less and less popular with time, and the Internet offered other ways to bet (along with lotteries). After going bankrupt in 2009, the OTB establishments finally closed their doors in 2010. You won't see OTB Parlors in the city anymore, just as you won't see as many bars of the type shown in the above picture. Times change, and as people change, so do the businesses in their neighborhoods. This is gentrification at the microscopic level. One other thing that I noticed is that they no longer allow parking on both sides of those little one-way streets. That is a very positive change, though, of course, it annoys car owners (about whom the city cares less and less). You used to have to thread your way down those tiny streets with poor visibility, fearing that someone would dart out from behind the parked cars to open their car door right in front of you, and hoping some pothole didn't you send you careening into a parked car. Now, at least you can see the people on the sidewalk on one side, leave yourself a little room between you and the parked cars, and you can drive down those streets without clenching the steering wheel in anxiety. Thank you for stopping by to see this entry in my "the more things change, the more they stay the same" series. It's a lot of fun seeing how areas evolve, sometimes it is the subtle changes that take place to ordinary places over time that tells you more than anything else about the people who live there. 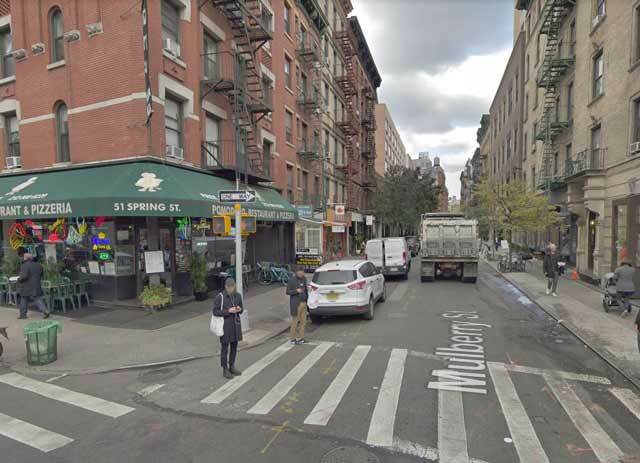 Southeast corner of Spring and Mulberry Streets, Manhattan, in the 2010s (Google Street View).